The title of a 1965 Yardbirds album was “Having a Rave Up,” and that’s exactly what the band had in Hermosa Beach earlier this month before a couple hundred at the Saint Rocke club, a cozy little place with excellent acoustics and overall sound. The band that formed in London in 1963 and is still led by drummer Jim McCarty has undergone big personnel changes over the past couple of years. But during the course of 19 songs in 80 minutes, these guys ripped as intensely as any Yardbirds contingent ever. The Yardbirds were a career-starting British Invasion group for legendary guitarists Eric Clapton (1963-1965), Jeff Beck (1965-1966) and Jimmy Page (1966-1968), each of whom are in the top five of Rolling Stone magazine’s 100 Top Guitarists of All Time – Clapton at No. 2, Page at No. 3 and Beck at No. 5. The latest in the string of killer Yardbirds guitarists is Johnny A (Johnny Antonopoulos), best known for his sever-year stint with J. Geils Band singer Peter Wolf. His loud, out-front, searing style of playing is more in line with Gypie Mayo, the group’s superb lead axeman from 1995-2005, who was an exponent of Page’s loud, ripping sound. Mayo’s successor, young Ben King (2005-2014), was proficient as all get-out, but he was a proponent of Beck’s thinner sound and that diminished the group’s power. Another important facet is the return of singer John Idan, also the Yardbirds’ bassist from the time McCarty and founding bassist-rhythm guitarist Chris Dreja resurrected the group in 1992. A stroke forced Dreja’s retirement in 2013. Beck lookalike Idan, who sounds remarkably like original singer Keith Relf, left in 2009, but returned a few months ago. It is so great to once again catch this band at the peak of their powers as they blast through such classic hits as “Heart Full of Soul,” “Shapes of Things,” their set-ending “I’m a Man” and especially the psychedelic masterwork, “Happenings Ten Years Time Ago.” They also played well connoisseur faves like “Little Games,” “The Train Kept a-Rollin’ ” and “Dazed and Confused,” a song Page stole from Jake Holmes and took credit for, yet one which the Yardbirds performed nightly during his time with the group in the late ’60s. It felt like the heyday of British blues-based rock ‘n’ roll on Saturday night, as the Yardbirds ripped through a high-energy set in front of a roaring crowd in the South Shore Room at Harrah’s Lake Tahoe. New lead guitarist Johnny A. has some mighty big shoes to fill, taking a seat previously occupied by Jeff Beck, Eric Clapton, and Jimmy Page. Fortunately, he was up to the task, tearing through the entire pantheon of blues guitar skills, with feeling. Massachusetts native Johnny Antonopoulos has collaborated with Delaney & Bonnie, Peter Wolf from the J. Geils Band, Doug Clifford with Creedence Clearwater Revival and Bobby Whitlock with Derek and Dominos. Sporting a quintessential Gibson Les Paul with a cherry sunburst finish, he kept the audience captivated from center stage, wailing, crunching, and shredding his way through the evening. Among other outstanding solos, he put on a solid display of Les Paul’s resonance during the driving tune “The Nazz are Blue,” plucking a low note and letting it hang for upwards of 20 seconds, the classic warm, over-driven tone pulsing and reverberating off of the high walls of the South Shore Room. Myke Scavone provided signature blues harmonica, both rhythm and lead, along with backing vocals and a variety of percussion. Scavone’s searing tone on “Train Kept a Rolling” and other tunes got cheer after cheer from the crowd, and he and Johnny A. sounded killer when doubling melody lines on harp and guitar, which they did on a number of tunes. A particular crowd favorite was colorful bassist Kenny Aaronson, who received a number of rousing ovations during the evening. Brooklyn-born Aaronson’s resume reads like a who’s who of rock and roll. He’s played with Johnny Winter, Dave Gilmour, Steve Cropper, Bob Dylan and the supergroup HSAS (Sammy Hagar, Neil Schon, Kenny Aaronson, Michael Shrieve). Clad in tight black jeans, black short-brimmed hat, and a swashbuckling black jacket, Aaronson brought an aggressive edge to his instrument, often planting his feet in a determined stance and wielding his bass aimed straight out at the audience like a spear. He routinely turned his back on the crowd to jam directly with McCarty, and the music always experienced an immediate uptick in intensity when he did so. Frontman John Idan, who sang lead on most songs and rocked rhythm guitar on a beautiful honeyburst-colored Les Paul. But onstage, something about him strongly evoked the character David St. Hubbins from classic cult film “Spinal Tap.” While his hair is more reminiscent of Nigel Tufnel’s, he bears something of a facial resemblance to St. Hubbins and sounded almost exactly like him, particularly when he spoke in between songs. He certainly did not evince the mind-numbing stupidity of the duo, but seemed strikingly similar in appearance and voice. It was pretty awesome. Idan got a memorable cheer from the crowd when he commented on Lake Tahoe’s natural beauty, filling a brief pause between numbers as Aaronson replaced a newly broken “A” string on his bass. “Tahoe loves you!” a woman shouted back. And the crowd did indeed. The Yardbirds have a long and storied history, and were part of the “British Invasion” of bands that broke out of the UK in the 1960s. The blues/rock band split up in 1968 and were inactive for many years until 1992 when founding members Chris Dreja (rhythm guitar) and Jim McCarty (drums) assembled a new version of the band to perform under The Yardbirds banner. The latter-day version of The Yardbirds have gone through numerous lineup changes over the years. Dreja departed The Yardbirds in 2013 due to medical reasons, which left McCarty as the sole original member of the band. While The Yardbirds were once an all-British outfit, the current lineup is four-fifths American with McCarty the Englishman in the band. In addition to McCarty on drums, The Yardbirds are now comprised of John Idan on guitar and lead vocals, Johnny A on guitar, bassist Kenny Aaronson, and Myke Scavone on backing vocals, blues harp, and percussion. The Yardbirds’ latest tour brought them to B.B. King’s in New York City on Monday night, November 2nd. Following a well-received 40-minute acoustic set by singer-songwriter Jann Klose, The Yardbirds took the stage and tore right into an absolutely stonking version of “Drinking Muddy Water.” The band was firing on all cylinders. McCarty was pounding the drums as if his life depended upon it, the guitars were sharp, and the blues harp howled. The set was packed with highlights. New lead guitarist Johnny A distinguished himself early on in the show with some scintillating guitar work on “I’m Not Talkin’.” Idan and Johnny A played very well off of each other during a terrific take on “Heart Full of Soul” that also featured strong backing vocals from Scavone. The performance of “The Nazz Are Blue” had an incredible twin guitar attack courtesy of Johnny A and Idan as well as soulful blues harp by Scavone. McCarty’s drumming on “Mister You’re A Better Man Than I” was superb. “I Ain’t Got You” was a positively ferocious bit of blues/rock while “Little Games” featured strong drumming from McCarty, pulsating bass by Aaronson, and great percussion work from Scavone. The band then segued right into a storming “Shapes of Things” that had a fantastic lead vocal by Idan, searing lead guitar from Johnny A, and thundering drums by McCarty. McCarty took on lead-vocal duties for “Back Where I Started,” a track that he had recorded in the 1980s while a member of Box of Frogs. In addition to McCarty, that band included original Yardbirds Chris Dreja on guitar and Paul Samwell-Smith on bass. The performance of “Back Where I Started” at B.B. King’s was terrific and was highlighted by Johnny A’s fretwork and Scavone’s blues harp mastery. The best part of the show was the searing take on “Over Under Sideways Down” that was anchored by Johnny A’s topsy-turvy lead-guitar work. A good bit of the crowd shouted “Hey!” on cue when required by the song. The guitar tandem of Johnny A and Idan was very effective on “Smokestack Lightning,” a performance that also featured stellar drumming from McCarty. For “Train Kept A-Rollin’,” The Yardbirds were augmented by Jon Paris on second blues harp and co-lead vocal. Paris has a Monday night residency at Lucille’s Grill at B.B. King’s and was terrific in his moment in the spotlight with The Yardbirds. When the song had concluded, McCarty told the crowd that Paris had been the one that recommended Aaronson to the band when they were looking for a new bassist. The main set concluded with the triple threat of “For Your Love,” “Happenings Ten Years Time Ago,” and “Dazed and Confused,” a track that The Yardbirds had recorded before Jimmy Page took it to Led Zeppelin with him and turned it into a rock classic. The three songs were a really effective way to end the set, as The Yardbirds kept upping the ante as they delivered explosive performances of the trio of classics. “Happenings Ten Years Time Ago,” in particular, was the standout of those three songs, just spectacular. After leaving the stage briefly, the band returned for a two-song encore of covers that included takes on Sonny Boy Williamson’s “Good Morning Little Schoolgirl” and Bo Diddley’s “I’m A Man.” Both were stellar, featuring terrific guitar work, drumming, and wailing blues harp. It was a fitting end to a performance that had been good, loud, and rocking. While most of the players in The Yardbirds have changed over the years, the band’s hallmark of top-notch musicianship remains. There are no passengers in this band. A well deserved welcome was given to John Idan (ex Yardbirds) and his band. It was great to see John back again who once again gave a great performance with a very nice selection of blues, some Elmore James, Otis Rush, Howlin Wolf and for good measure an old Bert Weedon number Guitar Shuffle done in a bluesy style. I enjoyed Got my Mojo Working done with a funky beat and a Norman Witfield number in particular. John did some excellent solo work on his Gibson Les Paul with lots of variation and tasteful licks. Ian was on the Hammond organ which had that familiar Leslie sound on which he played some very nice solos and fills. Peter on drums was allowed a short drum solo which we all appreciated and Fox on bass demonstrated many styles in fine style. The band were very tight even though they had only recently got back together and they were a joy to listen to and will be welcomed back in the future. Oldham seems positively chipper, having just been to see the Yardbirds at a local club the night before. "It was fabulous," he enthuses. "The sound was impeccable. They had little tricks that enhanced already good vocals. And what was most endearing was the singer, who wasn't an original Yard Bird, but when he introduced an old song, he talked as if it were his, as if he were in the original group." Ein echtes Solo-Album, auf dem jede Note selbst gespielt und eingesungen wird: fürwahr der Wahnwitz (THE FOLLY), für den der gebürtige Detroiter und Wahl-Londoner John Idan sogar die Yardbirds verließ. Das Resultat geriet eindrucksvoll – psychedelisch perlender Soft Rock, nicht meilenweit von Yardbirds-Drummer Jim McCartys Sitting on The Top of Time (2009) entfernt. Jeder Orgelton, jede Verzahnung akustischer und elektrischer Gitarren wirkt ebenso sorgfältig austariert wie der oft mehrstimmige Gesang, auch dank sensiblem Mixes durch Robin Black, der auch für Cat Stevens und Jethro Tull arbeitete. Hit-Verdächtiges wie ‚Banging My Head on the Wall‘ firmiert durchaus unter Beat – sowas bildete einst Äther-Futter für Piratensender zwischen Caroline und Veronica. Mit ‚Sunny Franziska of the Western World‘ kommen dazu noch McCartneyeske Violinen ins Spiel. ‚No Other‘ huldigt Lennon. Blues erscheint erst zum Finale – er ist bei dem hier gezeigten Einfallsreichtum eben nur ein Aspekt im Arsenal. The Yardbird sings on his own – with just a little blues in sight. If it may come as a surpirse to many that THE YARDBIRDS still exist, much more surprising is the fact that their singer’s horizon’s much wider than the the legendary band’s chosen genre – but then, that was the same with his predecessor, Keith Relf. A great vocalist in his own, here the Detroit-born John Idan goes the whole distance playing every instrument with a delicate help from a string quartet and tells it like it is – or, in the case of “The Ballad Of Myself” – like it was. His sincere delivery and the namechecking of his idols’ is disarming but there’s no naivete: just listen to the blues and raga aural allusions at the appropriate lyrical places. The ballad of his soul? Idan’s voice in “I Began To Realise” is soulful while the arrangement is Latin-tinctured and breezy. This easiness pervades all the album so even with “We All Belong” John escapes anthemic lures which he surrenders to in Lennonesque “Set Out Before The Sadness Comes”, but then Idan follows the George Harrison route in “That’s You And Me” with rare elegance, the influences are worn proudly on the sleeve. While the psychedelic chant of “The Kali Yuga’s Gettin’ Hot”, as fantastic as it is, sticks out of context like a soar Sly Stone-shaped thumb, “Banging My Head On The Wall” feeds to the boogie crowd with its jolly piano, and the organ-laden “Five More Nights” has the answer to the blues-asking lot. With so much going on here, John’s a revelation. John Idan has spent a dozen years or more being a Yardbird and been involved in their 'Birdland' album and also the 'Live At BB King's' release, has toured all over the place and helped to ensure that the good name of this most important of 60's guitar bands lives on in the 21st century. Now he has left the band to give himself the opportunity to create his own music and to display to the world his other influences and what else motivates him apart from pumping old school R'n'B. 'The Folly' is his first solo album and shows the breadth of his musical abilities to anyone who thought he might just be a handy bass player who sang too. John recorded, played and produced the album himself and so you get to hear his very skillful guitar playing, some really tasteful and funky Hammond organ playing and he also sings more in his own natural voice rather than having to be mindful of the vocal style of The Yardbirds' late Keith Relf. So one would imagine this has been quite a liberating experience for him. When you give the album a spin, you find that you're in a very different part of John's musical muse. It's on a funky, bright and breezy groove in places and any thoughts that it might be a straight ahead rock or even a straight rythmn and blues record are soon dispelled, there are however some hints of finest west coast influences in the mix. 'The Ballad Of Myself' is a gentle acoustic guitar led opener that builds via string parts and features haunting Hammond passages to accompany an autobiographical lyric. 'I Began to Realise' mixes funky latin grooves with west coast stylings to conjure up a joyful feelgood number, far and away from what one might expect of Mr Idan, but it's all the more better for it's ability to surprise the listener. 'More To This Than We Know' has a cool summery laid back groove, whilst ' Banging My Head On The Wall' has a happy go lucky style with a good singalong chorus to boot. 'Sunny Franziska of the Western World' features a string quartet to great effect and ' When You Were The One' has a tension and moody atmosphere that works really well and is one of the highlights of the album. The album closes with the bluesy 'A Long Time On This Road' and displays John's tasteful blues guitar playing to great effect. 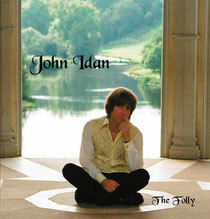 So this is John Idan the solo performer, he had a career before his most blueswailing interlude and now he is at a point where he can be be his own master and go where the muse takes him. If you're looking for a musical link from his recent activities then you'll struggle to find it. What you will find is a very talented solo multi-instrumentalist from Detroit who is making his own music and making a very good job of it in the process, this is the new John Idan.......singing like a 'bird released! been at Twickenham the night before she might have thought differently. proved me wrong. Now I wonder how on earth they are going to replace John Idan. In the late 80, “Detroit John”, as he was known then, moved from his native Michigan to London and got a gig as singer and second guitarist in the Topham-McCarty Blues Band – led by Yardbirds drummer Jim McCarty and the groups original (pre–Clapton) lead guitarist, Top Topham. That eventually led to his current gig as bassist and singer in the reformed Yardbirds. He can be heard pulling double duty (spelling original bassist Paul Samwell-Smith and the late vocalist Keith Relf) on the band’s star-studded Birdland (2003). On his self-produced solo debut, Idan supplies all instruments (except for a string quartet) – recorded, he stresses, in analogue in real time and on real instruments – though, to his credit, the overdubbed one-man-band aspect would be impossible to detect if he hadn’t divulged details. The biographical opener “The Ballad of Myself” has a distinctly Cat Stevens feel – not coincidently, no doubt, as the CD was mixed by Robin Black (known for his work with Stevens, Jethro Tull, Gerry Rafferty, and others). For the most part, Idan eschews the often hard edge of the Yardbirds in favour of a folkie feel, with layered acoustic rhythms – ironically sounding more English than the blues-rock Brits he fronts. When he does step up to play lead, though, he displays a style that’s both melodic and muscular. The Beatles-esque “That’s You and Me” reveals an uncanny ability to mimic George Harrison’s slide style. If all the above-mentioned genres have you second-guessing from pigeonhole to pigeonhole, that’s the nature of this eclectic showcase. But Idan’s voice (vocally, instrumentally, and compositionally) ensures cohesion on this very auspicious outing. This album has 13 songs, and in the days of Top 40 radio...all 13 would have been hits. The songs are diverse musically, and the music arrangements, lyrics, and melodies are solid throughout the album. When I listen to The Folly, I can hear the multiple influences that John must have been exposed to growing up. He's able to draw us in "to feel" the music. This may happen due to his long experience as a live performer. Truly, there is magic in the connectivity John makes with the listener that I haven't felt since Harry Nilsson's, Nilsson Schmilsson. This is a no hype review of one very amazingly solid album. A big Thank You to John Idan.